Newcastle United legend Kevin Keegan has revealed how a potential deal for Luka Modrić in 2008 was blocked by the club's hierarchy, and the midfielder ended up at Tottenham Hotspur. 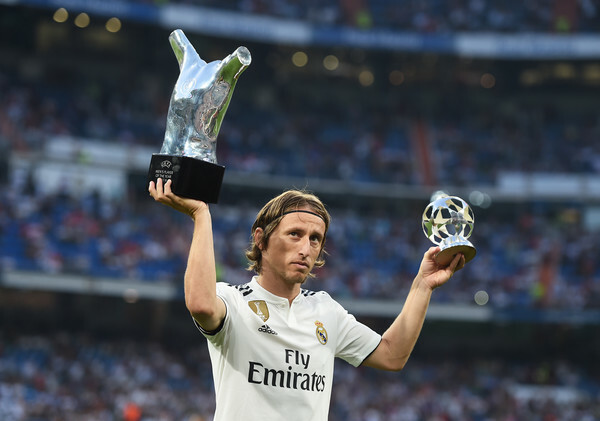 Luka Modrić of Real Madrid celebrates with his 2017/18 UEFA Men's Player of the Year award before the La Liga match between Real Madrid CF and CD Leganes at Estadio Santiago Bernabeu on September 1, 2018 in Madrid, Spain. The Magpies were among those to be heavily linked with the Croatian maestro during his time at Dinamo Zagreb. Then-manager Keegan had managed to arrange a meeting with Modrić's agent before Tony Jimenez, the club's vice-president in charge of player recruitment at the time, pulled the plug on the deal. And Newcastle supporters will be aggrieved to learn that they could have landed Modrić before he went on to become one of the world's top players. Writing in his new book, "My Life in Football", Keegan relayed how Newcastle turned down the chance to sign the World Cup star because he was "too lightweight". At one point I took a call from Luka Modrić's agent to ask if I would be keen on signing the player from Dinamo Zagreb. Modrić had already been speaking to Spurs and his agent was honest enough to explain the move to White Hart Lane was likely to happen. His agent flew up from London. I explained what a great club Newcastle was, how the supporters would adore Modrić and how we were looking for someone to spark us off. Then Jimenez piped up. "Can I come in here?" he said. "I don't think Luka is good enough for the Premier League. He's too lightweight. He's decent, but he's not good enough." It was an awful moment and, 10 years on, it needs only a cursory glance at Modrić's achievements to realise what a nonsense it was. Even back then, however, it was laughable. Modrić instead ended up at Tottenham, where he emerged as one of the best midfielders in world football. The 33-year-old moved to Real Madrid for £30 million in 2012 and has been a key player for the Spanish giants ever since. He was recently named UEFA's Player of the Year after winning three Champions League trophies in a row for Los Blancos and pulling the strings for Croatia en route to the summer's World Cup final. Meanwhile, Newcastle signed both Danny Guthrie and Kevin Nolan in that summer of 2008 instead.